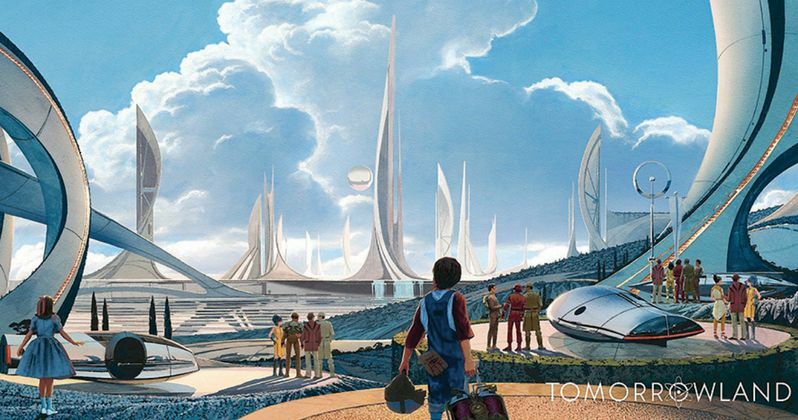 Fans attending New York Comic-Con tomorrow will get their first look at Disney's highly-anticipated and mysterious adventure Tomorrowland during Disney's panel, but today, Entertainment Weekly has released the first photos and concept art, featuring stars George Clooney and Britt Robertson. The plot centers on a young Florida girl named Casey Newton (Britt Robertson), an optimistic and perpetually-curious teenager who discovers a pin that gives her a unique vision of the future every time she touches it, which can be seen in the concept art below. This vision sends her on a quest with a disillusioned genius named Frank Walker (George Clooney) to find the magical world of Tomorrowland. Director Brad Bird revealed that the movie begins by asking questions about the good and bad aspects of the future. "We begin our movie asking what did [the future] used to be? What's good about the future and what's scary about it? And we wrestle with those things in a slightly mythical way." The title is taken from Disneyland's futurist attraction, with screenwriter Damon Lindelof, who crafted the story with EW television critic Jeff Jensen, revealing that Walt Disney himself is referenced in Tomorrowland, but he is not a character. "What Hogwarts is to magic, Tomorrowland is to science: They are both easy to find if you are a wizard and very difficult to find if you're a Muggle. Walt Disney is not a character in our movie, but he is referenced as having some involvement in this mysterious place called Tomorrowland, as a huge futurist and aficionado of space travel, rocketry, cities of the future, and space travel." Britt Robertson's Casey is constantly dreaming of the future, and must watch as the launchpads of Cape Canaveral are being disassembled as the space shuttle program is shut down. Although she still holds out hope for a better world in Tomorrowland. Here's what Damon Lindelof had to say about NASA closing up shop and Casey's optimism. "It's closed for business. There are no launches anymore. But she still holds a candle, she still believes in this amazing future, that things can be better." He also offered more details about the magical pin that Casey finds, which opens up a whole new world to her. "There is a piece of technology in this pin, it's the kind of old-school pin you would wear on your lapel, and when you make physical contact with it, you have the illusion of being physically transported to another world, and that's how Casey gets her first glimpse of Tomorrowland. She is a Muggle who accidentally wanders across Platform 9 ¾ and sees something she probably shouldn't have." Director Brad Bird adds that Casey isn't quite sure what she experiences when she first touches the pin. "At first when she experiences this thing, she's not sure if it's real or not. It's kind of like being hit by a dream and not sure whether the dream was a dream or real." Eventually, Casey's quest for knowledge about this pin leads her to George Clooney's Frank Walker, a failed inventor who has some experience with Tomorrowland. Here's what Brad Bird had to say about Frank's living conditions when Casey first meets him. "He's at this farmhouse, and it's probably the house he's grown up in. He hasn't done anything to it. He's done tech stuff inside it, but it's not a super cool bachelor pad. It's more like a guy who is retreating when something didn't go well." The director also explains why George Clooney was perfect to play Frank. "There's something about George. You can see the wheels turning in his eyes, and he reads as somebody who is very principled. He seems like a very pragmatic guy who also dreams, but he's not flighty. There's an integrity to him that you feel." Damon Lindelof also explained that he was influenced by a number of sci-fi authors to create a sense of "true modernism" instead of "retro-futurism." "I'm a huge fan of (Ray) Bradbury, (Robert A.) Heinlein, (Carl) Sagan and the great genre writers. I do think that The Martian Chronicles are part of a bygone age, but the best sci-fi is also evergreen and just as potent today as it was when it was written." The writer also noted that the 1977 sci-fi classic Close Encounters of the Third Kind was also a big influence on how the story of Tomorrowland was crafted. "Another big influence for Jeff Jensen and I when we first started talking about this story was Close Encounters of the Third Kind. Somehow it was able to do what no modern movies are able to do, which is tell a story that doesn't have a bad guy who is trying to blow up the planet, or giant robots fighting, or lots of karate-though who doesn't love karate? It was so not plot driven. It was just a pure discovery movie. It was pure what-if. Just that idea of what's going on here? What does this mean? That was a real jumping off place for a movie like this." Take a look at the first photos from Tomorrowland, and stay tuned for more details when the highly-anticipated film hits the NYCC stage tomorrow.